Korean Cultural Center of the Philippines presents 2011 Korean Film Festival from September 20 to October 2, 2011 at three (3) SM Cinemas in Mall of Asia, North Edsa and Cebu. 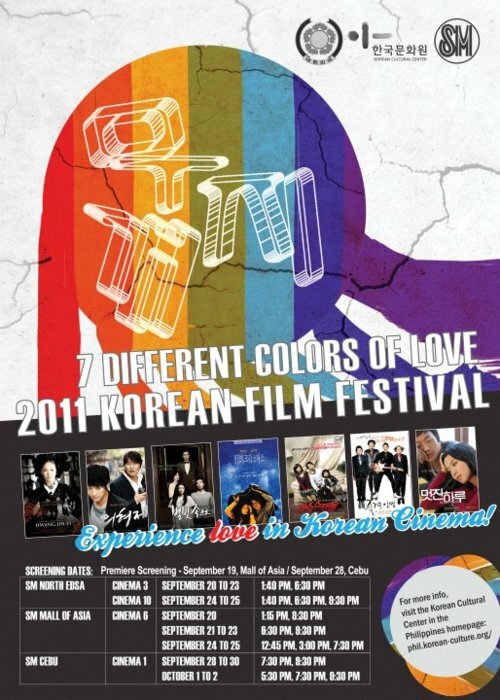 With the theme "7 Different Colors of Love," the festival features seven (7) Korean films that tackle love. Last year, they focused on horror films. For SM Mall of Asia (Cinema 6) and SM North Edsa (Cinema 3), the festival runs from Sept 20-25; while for SM Cebu (Cinema 1), it runs from Sept 28-Oct 2. Admission to ALL films are FREE to the public.